Syros Island, Cyclades Islands, Holidays in Greece, the Greek Travel source. Ermoupolis is not only the main town of Syros but is also the administrative capital of the whole Cyclades. Our reason for choosing this large town is purely selfish, for Ermoupolis is probably one of the most interesting towns. A period of great wealth and elegance in the 17th & 18th centuries has bequethed Ermoupolis with neo-classical style buildings on the grandest of scales. The central square with the massive town hall surrounded by cafes is a good starting point as you stroll from the church to museum to market to waterfront and beyond, as each turning reveals something new. The two hills of Ano Syros with its medieval town and Vrontado topped by the church of Anastasis climb high above the shoreline of Ermoupolis and complete the tableau of what is a Greek Island holiday with a difference. 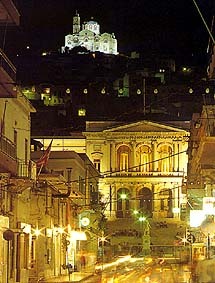 Syros has been one of the Cycladic Civilization centers. It has been inhabited since the Neolithic years and there are archaeological finds that date back to the start of the Neolithic Age around 3000 BC. Homer reports that two cities thrived in the whole island: Phoenice and Posidonia. Ermoupoli: Archaeological Museum. The Town House. The Jesuit monastery. The Capuchin monastery. Cycladic Art Gallery. Medieval scheduled settlement. The catholic church of St. George that dominates the hill. The museum of Marcos Vamvakaris. The Capuchin school.